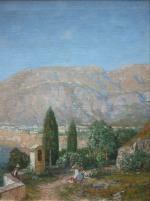 The author of our great view of Sorrento on Neapolitan coast is renown German landscape painter Georg M. Meinzolt (born 1863 in Hamburg), he worked in Hamburg, studied in Weimar by Th. Hagen (1881/1886). 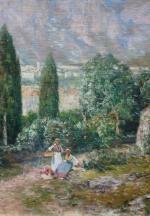 In 1891-1912 worked in Munich, travelled to Scandinavia, Italy. His works are in the Museum of Weimar and Lindenau-Museum Altenburg. 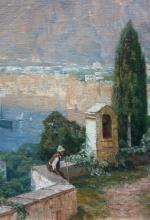 Inscription: signed lower left, on the frame - original metal plaque with name of the artist. Technique: oil oncanvas. Luxuriousy original gold-plated frame. Measurements: unframed w 39 3/4" x h 26" (101 x 66 cm), framed w 50" x h 36 1/4" (127 x 92 cm).